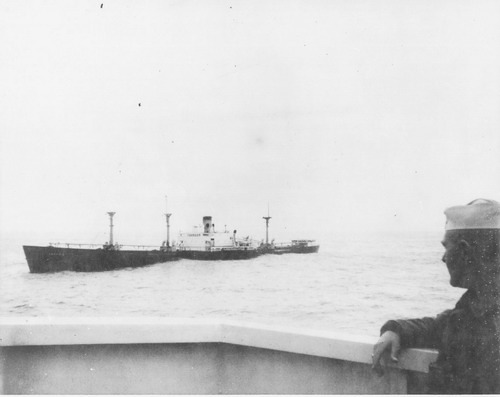 It was in the midst of a severe North Atlantic gale on January 10, 1966 that the skipper of the 441-foot Greek freighter Lampsis radioed the following: "I fear I may have to abandon ship at daybreak. Maybe sooner." The U.S. Coast Guard ship Androscoggin responded to the stricken vessel, about 700 miles East of Bermuda, after learning that the Lampsis cracks had developed in the ship's steel hull and the freighter was taking on water. The vessel was en route from Casablanca to Philadelphia with a cargo of manganese ore. The situation was so bad by the time the master asked for help, the rising water had risen to nearly 15 feet in the engine room and the vessel was adrift at sea, without power. The Androscoggin, commanded by Captain Emerson Hayes Jr., reached the sinking freighter on January 11 while the ship was still afloat. He found that the stress of the storm cracked the vessel's bulkhead between the boiler room and the number three hold. The cutter stood by the Lampsis until dawn, and then sent a repair party to see if anything could be done to save the freighter. By the next morning all hope was abandoned and the ship's coxwain, Boatwain's Mate Roger Boggs, directed four dangerous trips between ships, in heavy 20-foot swells, to rescue all 30 members of the freighter's crew. Boggs later received commendation for his work that morning. The Lampsis was an American-made Liberty ship, launched as the J. D. Ross in Portland, Oregon, in 1943. The Liberty ships were made of brittle steel that was notorious for cracking under stress at sea. This vessel remained at sea long enough to be thought of in its day as an old "tramp steamer." She also had undergone various owners and name changes. 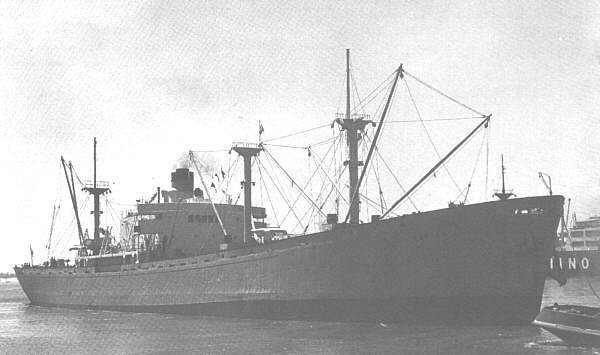 In 1947 she was the Governor Miller, in 1949 she was the Irenestar, a name the ship carried until it left U.S. ownership and was bought by the Proteus Shipping Co. of Greece and named Lampsis.